Air fresheners and scented candles are popular in many homes, especially especially around the holidays, to mask normal household odors. But allergists say these products can be linked to a growing number of respiratory problems. 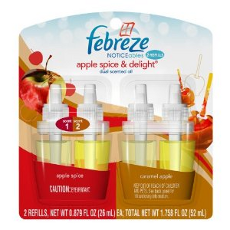 The upside to these products is they make a house smell pleasant, often evoking fond memories of apple pie or cinnamon. But Fineman says many of these products contain volatile organic compounds (VOCs) and are merely “covering up” — not eliminating — odors in the home. VOCs commonly found in air fresheners include: formaldehyde, petroleum distillates, limonene, esters and alcohols. Fineman says a study of plug-in deodorizers found more than 20 different VOCs with more than one third of those classified as toxic or hazardous. Fineman says consumers should be particularly concerned if someone in the household has any kind of respiratory issues. He says studies show that even VOC exposure levels below currently accepted recommendations increase risk of asthma in children. High concentrations of VOCs can trigger eye and respiratory tract irritation, headaches, dizziness, and even memory impairment. Despite all this, the home fragrance industry is expected to see continued growth, reaching $8.3 billion in global sales by 2015. So, why the fondness for air fresheners? Fineman is not the first to warn about dangerous chemicals in air fresheners. A 2010 study led by the University of Washington discovered that 25 commonly used scented products (like laundry detergent and air freshener) emit an average of 17 chemicals each. Of the 133 different chemicals detected, nearly a quarter are classified as toxic or hazardous under at least one federal law. Only one emitted compound was listed on a product label, and only two were publicly disclosed anywhere. Even so-called "green" products were not "safe." The best air freshener, he says, is fresh air. On days when the weather allows, he suggests opening a window, at least for a short time, to naturally air out the house.